Select exercises to toggle them as "hidden" or "shown" from the browsing pages. When your finished, click the "DONE" button. Allow only specific members access to your saved routines. Allow only specific members access to your private exercises. Print home exercise programs for FREE. Please log in or sign up to use this feature. 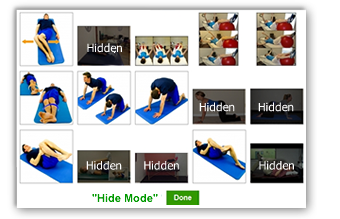 You are in "Hide Mode", toggle exercises as "shown" or "hidden" by clicking on an exercise image. Instructions: Please refresh your browser after a few minutes. HEP2go Pro features are not activated until we receive payment confirmation. You have attempted to change the email address associated with your account. An email has been sent to you at the new email address. Please confirm and activate the new email address with the link provided in the email we sent you. Please note... the password has not changed. You currently have a Free membership. Only 2 routine names are available with a Free membership. You can still save this routine, but you cannot change its name. You are trying to save a routine that has exercises that weren't shared to you. These exercises won't be visible in your routine. HEP2go.com is for rehab professionals such as physical therapists, occupational therapists, athletic trainers, chiropractors, orthopedic doctors, etc to create and share home exercise programs for their patients and or clients.